Beginning in 2018, the school will be launching a series of semi structured events and community conversations to promote dialogue across our silos. The spirit of the conversations respects the Ghanaian (Twi) concept of remembering the past to prepare for the future. The series grew out of the idea that new members to the community bump into Heller’s Ford Hall history. The Sankofa community conversations are intended to provide an opportunity for frank intimate conversations. Sometimes the conversations will be in the form of panel discussions. Other times the conversations will be part of hosted lunches with small numbers of community representatives. We hope everyone will join in on this effort, eventually becoming change agents/bridges across our silos. Following the spirit of Sankofa, Heller students identified the need to make community conversations more continuous. One Community Day that was an afternoon per year was insufficient. In that spirit we are beginning to brainstorm how to host a community day per month, organized by 2-3 working groups along with faculty and staff representatives. The theme would be Sankofa and Issues in Inequity. Groups determine the session and workshop topics and can range from issues of women’s issues, black themes, LGBTQ topics, Sin Fronteras, and barriers facing people with disabilities. First Sankofa Community Conversation Welcomes Mel King to Heller (story and video). 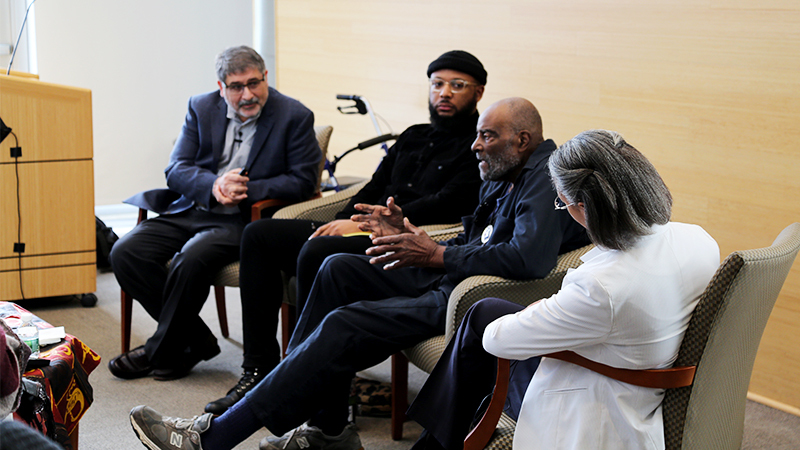 The Heller School welcomed a panel discussion of social justice and change, featuring activist and academic Mel King as well as alumnus Christian Perry. Kimberlé Crenshaw, 2016-17 Gittler Prize winner, talks with Rajesh Sampath, associate professor and associate director of the Master's Program in Sustainable International Development at the Heller School.